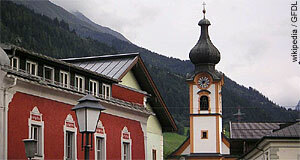 Mittersill is a small city in the south-west of Salzburg, more specifically the Pinzgau region. Mittersill has approximately 5,500 residents and is the major centre of the Oberpinzgau area, a thinly populated region that partly belongs to the National Park Hohe Tauern. Mittersill can be found in the Salzach river valley, at a traditionally important spot for trade and transportation. It lies at an altitude of 790 metres (which is pretty low by Pinzgau standards) and is well-known as a transit spot between Bavaria, Italy and Salzburg. That being said, Mittersill is still a little mountain village when it comes to general appearance: Much more harmful to that was the rise as a hiking and skiing centre rather than increased traffic. However, tourism′s side-effects were generally rather positive for Mittersill, which due to its remoteness is in a structurally rather battered area. For example the Austrian ski brand Blizzard, which was founded in Mittersill in 1918 (but did not become a major success until 1953). Note the local castle of Schloss Mittersill. During WWII, it housed a side-branch of the concentration camp KZ Mauthausen. Right after the war, Mittersill was among the first communities in Austria that developed ski lifts and facilities. The Pinzgau, Tyrol and Vorarlberg were genuine pioneers in this area - and Mittersill at the top of the crowd. In 2008, Mittersill was elevated to the rank of a city. The main attraction of Mittersill is the visitor centre of the National Park Hohe Tauern. It is only one of several visitor centres, but the biggest in the Salzburg share of the park. The modern exhibition will give you a quick and stimulating overview on flora, fauna, geology and culture of this scenic part of the Alps. Here you will also get advice for good hiking routes. In terms of sightseeing, Mittersill has a compact town centre with a couple of sights that deserve a closer look. The parish church St. Leonard dates back to the 13th century; the church St. Anna was built in Tyrolean Rococo in the late 18th century; the chapel of St. Nikolaus was Gothic, but gained Baroque and Rococo features in the 18th century. Note the town museum in the Felbenturm, an old fortified tower.